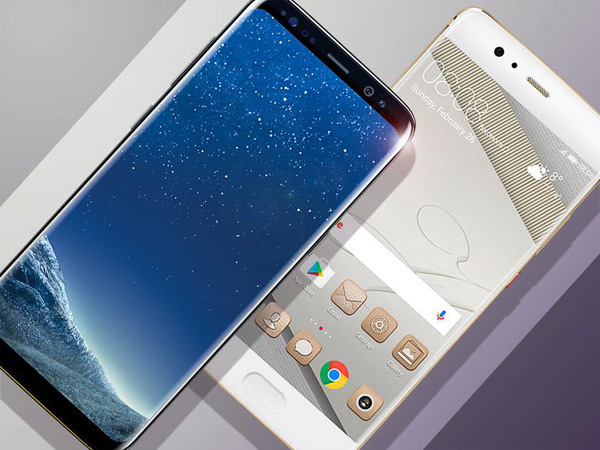 Before the Samsung Galaxy S8 and S8 Plus came out, we already had a certifiable five-star, 2017 Android flagship: the Huawei P10 Plus. We’re impressed with the Huawei P10 Plus, but can it really compete against Samsung’s best? Let’s have a look at how the larger Galaxy S8 Plus compares to the P10 Plus. If there’s one obvious knock against the P10 Plus, it’s that the design of the phone isn’t likely to turn any heads. Actually, that’s not entirely true: the Pantone-inspired Greenery and Dazzling Blue are one-of-a-kind styles that we’ve really fallen for. That is very much not the case with the Samsung Galaxy S8 Plus, easily the most beautiful handset we have ever laid eyes on. It’s curved on the right and left sides like the past Edge models, but this one also ditches much of the top and bottom bezel (along with a physical home button) to go almost all-screen on the front. The back and sides aren’t a big shift away from the last two Galaxy S models, but the Galaxy S8 Plus greets you with such a daring and dazzling face that we can’t help but be wowed. For starters, the Galaxy S8 Plus ditches the familiar 16:9 widescreen dimensions for an 18.5:9 aspect ratio instead, which means it’s extra tall in one hand, or a little wider while on its side. Why do this? Well, it gives you more screen space without making the phone much wider; that’s how a 6.2in AMOLED display can fit on a phone that is just less than a millimeter wider than last year’s Galaxy S7 Edge, which had a 5.5in screen instead. The S8 Plus screen isn’t much larger than the standard Galaxy S8 model’s, which has a 5.8in panel instead. Huawei’s option is a lot simpler in approach: it’s flat, it’s widescreen, it’s 5.5in, and it’s an LCD panel. It’s large, bright, and beautiful, with excellent viewing angles, even if LCD screens don’t offer the deep blacks and contrast of a great OLED panel.